The VA Hybrid ARM loan combines the qualities of both fixed and adjustable rate mortgages. This mortgage begins as a fixed rate mortgage for the first 3, 5, 7, or 10 years with interest rates locked into place. Following this period, the mortgage becomes an adjustable rate mortgage with variable interest rates. At this time, the interest rates will annually adjust for the remainder of the loan term, which in the case of a VA Hybrid ARM may be either 15 or 30 years. While interest rates are adjustable, they may only fluctuate one percent each year, and additionally, interest rate adjustments cap at five percent above the initial rate for the course of the loan. For borrowers who choose a 3/1 ARM, the first interest rate adjustment occurs 36 months following the date of the initial mortgage payment. If a borrower chooses a 5/1 ARM, the first adjustment occurs 60 months after the first mortgage payment date. The VA Hybrid ARM is tied to the 1-Year Constant Maturity Index and has a margin of 2.00 percent or 2.25 percent. Quarterly rate adjustments take place on the first day of January, April, July, and October. The rate to qualify is called the Initial Note Rate. Low initial rates – One of the principal reasons that borrowers select a hybrid adjustable-rate mortgage loan rather than a mortgage with fixed-rate interest is that the initial interest rates are particularly favorable; during the initial period of the loan, the fixed rate of a hybrid VA loan is lower than standard fixed-interest rates. Flexibility – VA Hybrid ARM loans additionally allow you to select the period of fixed-interest payments, enabling borrowers to assess the economic climate and decide between a 3, 5, 7, or 10-year fixed-rate period. To acquire the lowest possible rates, borrowers should select the three-year fixed-rate period. However, borrowers concerned with potential interest rate surges should consider locking in a ten-year fixed-interest period. Refinancing for low rates – VA loans allow borrowers to reap the benefits of low fixed rates while still being able to refinance the loan to avoid potentially higher interest rates following the initial fixed-rate period. In other words, some borrowers avoid the adjustable-rate period altogether by refinancing after the initial fixed-rate period ends. Borrowers who attempt to capitalize on the low fixed-rate period of a VA hybrid ARM without planning out a way to afford adjustable rates should be careful. While many borrowers refinance once the loan becomes adjustable-interest, this option is not always available. For instance, if the lending market declines and does not extend credit during the year when the payment plan switches, the additional monthly charges can lead to financial difficulties. Furthermore, if the homeowner has any employment issues or is unable to qualify for refinancing, he or she may be forced to pay the higher monthly payments with higher interest. 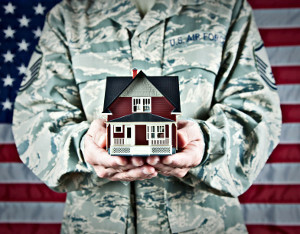 The most standard option for VA mortgages is a fixed rate interest program. As the name suggests, interest rates on these mortgages remain static throughout the term of the loan. Since rates do not fluctuate, borrowers will always be aware of their monthly mortgage payment costs, making budgeting much simpler. Also, interest rate increases will not affect fixed rate VA mortgage rates, making it a safe option; although, the converse is also true, as interest rate decreases will likewise have no benefits to a fixed rate mortgage. Stability – Since monthly payments will remain static over the entire course of the loan, this repayment plan offers the most security. More expensive – Buyers must pay a premium with fixed-rate mortgages; generally, FRMs costs more than ARMs over the life of 15-30 year home loans. Another option for VA mortgage repayment is the adjustable rate mortgage (ARM). For these mortgages, interest rates shift gradually in the direction of the index to which the mortgage is tied. Unlike fixed rate mortgages, VA ARM’s can be somewhat risky, as increasing interest rates could result in a much greater overall cost than initially estimated. However, adjustable rate mortgages set a cap on the amount of change that can occur, meaning that gains or losses are controlled. Lower interest rates – With more risk involved, lenders offer much lower rates for ARMs, allowing borrowers to borrow more and thus afford a more valuable home. Rates subject to change – As the name suggests, ARMs are adjustable, and borrowers with a tight budget may be put into financial difficulty if payments rise above the borrower’s affordable range. While choosing the optimal repayment plan requires careful consideration of your financial circumstances, each payment plan suits a different sort of borrower. Since the interest rates never fluctuate, borrowers with FRM loans do not need to concern themselves with raising their income to afford mortgage payments, but rather need to maintain a steady income. As such, FRM loans best fit borrowers who value stability and have less confidence in the economy or their job security. Also, adjustable rates involve some risk in that interest rates can raise and potentially put a borrower into financial hardship. Accordingly, adjustable rate mortgages suit borrowers who can afford to take the risk, as interest rate fluctuations can also be positive and result in lower rates, depending on the relevant pricing index. ARMs can also benefit borrowers who plan to live in a residence for a short time, typically less than five years. Finally, VA hybrid adjustable rate mortgages combine the advantages and disadvantages of both FRMs and ARMs. Since it begins with a lower payment but allows for increases, VA hybrid ARM loans are optimal for borrowers with low to moderate income who can afford the initial fixed rate period but expect an increase in income. Due to the complicated eligibility requirements and military exclusivity of VA loans, finding the right lender may take some time. Always take the time to shop around for the best rates and the fairest loan terms before committing to anything. f you are considering a VA loan, start shopping today by simply filling out Lender411's VA Request a Quote form on the top of the page. Give it a try today and take the first step toward a smart VA mortgage.